Researchers imaged the structural and chemical evolutions of LiCoO2 cathodes upon Li dendrite contact at an atomic scale. A spontaneous, irreversible conversion reaction leads to the formation of Co metal and Li2O, with CoO as a metastable reaction intermediate. Enlarge Image. Rechargeable lithium (Li) batteries are the most widely used energy storage devices found in consumer electronics and electric vehicles today. There are challenges, though, to optimizing their capacity, recyclability, and stability. During a Li battery’s charge-discharge cycles, highly localized Li dendrites—strands of Li that grow inside batteries—can form and hurt the battery’s performance. “Lithium dendrites are fine strands, like whiskers, that can come in contact with cathode materials and cause a chain of irreversible, spontaneous chemical reactions,” said Yingge Du, a researcher from Pacific Northwest National Laboratory (PNNL) who recently led a study to visualize this phenomena. “It can lead to performance decay, short circuiting, and safety hazards,” he added. Du and his team sought to pinpoint the exact failure mechanism. To do so, they needed to precisely control how and when the Li dendrites came into contact with the cathode materials. The team used in situ transmission electron microscopy (TEM) to directly image the structural and chemical evolutions of lithium cobalt oxide (LiCoO2) thin film cathodes on Li dendrite contact. “LiCoO2 is still one of the most widely used cathode materials,” said Du, “and making it into well-defined single-crystalline form by pulsed laser deposition can unleash the power of advanced electron microscopy.” Using this approach, researchers discovered an unexpected Li propagation pathway and detailed reaction steps that lead to the cathode failure. Their study, "Direct Visualization of Li Dendrite Effect on LiCoO2 Cathode by In Situ TEM," was recently published in Small and featured on its cover. Why it matters: To meet the increasing demands for large-scale energy storage devices, there is an urgent need for researchers to develop safer, rechargeable batteries with higher energy output. Li metal has been regarded as an ideal, high-capacity anode material. However, its use is greatly hampered by the formation of Li dendrites that can penetrate the separator—a permeable membrane placed between a battery’s anode and cathode. Once Li dendrites are in direct contact with cathode materials, a chain of irreversible, spontaneous chemical reactions can occur, leading to performance decay, short circuiting, and safety hazards. While significant efforts have been devoted to detect, understand, and prevent the Li dendrite formation within the electrolytes, little is known regarding the detailed reaction pathways involving Li metal and cathode materials. Bridging this knowledge gap may provide detection and design principles that are critical to future energy storage solutions. Summary: In this study, Yingge Du and his team of researchers at PNNL studied Li dendrites and their effect on cathode materials. They sought to understand the detailed reaction pathways, which could lead to the development of better Li batteries. 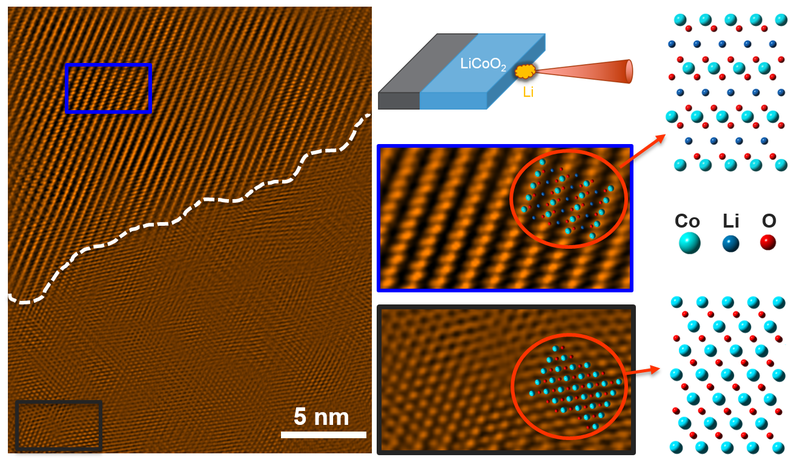 Using pulsed-laser deposition, Du and his team fabricated well-defined, epitaxial LiCoO2 thin films with controlled crystallographic orientations to serve as the model cathode materials. A Li metal tip was used to mimic the Li dendrite inside a TEM to study its reaction with prepared LiCoO2 samples. Advanced microscopy and spectroscopy techniques—including scanning transmission electron spectroscopy, nanobeam diffraction, and electron-energy loss spectroscopy—allowed such reactions to be investigated with high spatial and temporal resolution. In combination with density functional theory calculations, researchers elucidated the reaction steps, intermediates, and final products at an unprecedented level. An unexpected Li diffusion direction perpendicular to the Li-containing planes was found, which tore the LiCoO2 crystal apart, generating large amount of grain boundaries and antiphase boundaries. While Co metal and Li2O were found to be the final products of the full conversion reaction, CoO was identified as a metastable intermediate at the reaction front as a result of facile phase transition from LiCoO2. "The reaction steps and intermediates revealed provide a clear failure mechanism for the LiCoO2 cathodes caused by Li dendrites, and may also offer insights into the over-discharge processes in cathodes," remarked Du. What's next? Continuing this work, Du's team intends to fabricate all-solid-state batteries by multi-step deposition processes using pulsed-laser deposition to better understand the ion transport processes across the well-defined interfaces. Acknowledgements: This work addresses the Basic Research Needs for Synthesis Science for Energy Relevant Technology as identified by U.S. Department of Energy (DOE) Office of Science, Office of Basic Energy Sciences (BES), including Priority Research Direction 2 ("Accelerate materials discovery by exploiting extreme conditions, complex chemistries and molecules, and interfacial systems") and Priority Research Direction 4 ("Integrate emerging theoretical, computational, and in situ characterization tools to achieve directed synthesis with real-time adaptive control”). Sponsors: This work was supported by the DOE, Office of Science, Office of Basic Energy Sciences (BES), Early Career Research Program under Award No. 68278. P.V.S. was supported by the DOE-BES Division of Materials Sciences and Engineering under Award No. 10122. A portion of the research was performed using the W. R. Wiley Environmental Molecular Sciences Laboratory (EMSL) (Ringgold ID130367), a DOE Office of Science User Facility sponsored by the Office of Biological and Environmental Research and located at PNNL. PNNL is a multi-program national laboratory operated for DOE by Battelle under contract DE-AC05-76RL01830. User Facilities: This work was performed using the W. R. Wiley Environmental Molecular Sciences Laboratory (EMSL), a DOE Office of Science User Facility sponsored by the Office of Biological and Environmental Research and located at PNNL. Research Team: Zhenzhong Yang, Phuong-Vu Ong, Le Wang, Timothy C. Droubay, Peter V. Sushko, Yingge Du, and Wu Xu (PNNL); Yang He, Mark E. Bowden, and Chongmin Wang (EMSL, PNNL).